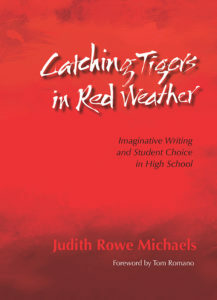 This is an excerpt from Chapter 5, Catching Tigers in Red Weather: Imaginative Writing and Student Choice in High School, by Judith Rowe Michaels (NCTE, 2011). While it’s important to help students see and hear and wonder at a poem unfolding on the page as they read or listen, it may be even more crucial for them to experience discovery and surprise as a poem of their own takes shape. I might discuss why I used certain words and phrases from the original notebook entry and how I kept reading aloud as I drafted the poem because that not only helped me hear where to break lines and change words for better sounds but also seemed to keep ideas and feelings ﬂowing. But the kids need to meet a live poet who’s not their daily teacher. So I like to bring in a visiting poet early in the writing process, preferably someone of a different age, gender, or race than mine. This person needn’t be from outside the school, though when we have the money, I do invite an established poet to spend several days working in all the ninth- and tenth-grade classes. One can ﬁnd poets through a state arts council, or through writers-in-the-schools programs; I’ve invited poets I meet when I give or take workshops and attend writing conferences. But another teacher, or a student’s parent, or one of our alumni—or even a talented twelfth grader—can be an effective guest artist, depending on the strength and accessibility of their work and their ability to connect with teenagers. This year we have a new poet in our department, a young woman who’s studied in Oregon with Dorianne Laux and whose sample class, a poetry workshop, impressed me when she came to interview. I invite her to give this workshop to my students. Kate Westhaver talks to the kids about why she writes poetry: that it’s a love–hate relationship because it makes her think but also confuses and scares her. For her, writing a poem has an element of play. Kate hands out copies of e. e. cummings’s “anyone lived in a pretty how town.” I’m happy that we have another “story poem” here—another life “journey,” though a somewhat different one from “Charlie Howard’s Descent”—and one that offers both mystery and music. When the reading ends, students have discovered some new options for their own poems: varying refrains, off-rhymes mixed with true rhymes, four-beat lines, the absence of punctuation and capitalization, and a whole new take on language—or, to use a word most of them don’t know—syntax. She invites us to go on thinking about the poem on our own and moves us into her writing exercise. First, she invites us to get up, stretch, and ﬁnd new seats. Then she has us each divide a sheet of paper into quarters, number them, and listen to four excerpts from four pieces of music that she has on her iPod. The kids are excited. Some are already starting before Kate has ﬁnished giving directions. As we go around the circle and hear each writer’s comment, I ask for volunteers who can remind us of anything else from that particular poem. Gradually, if we listen to enough poems together this way, the students will ﬁnd they can experience a poem more fully—notice and remember, feel more. Judith Rowe Michaels is poet in residence and English teacher at Princeton Day School in Princeton, New Jersey, as well as a poet in the schools for the Geraldine R. Dodge Foundation. She is a member of the nine-women performance and critique group, Cool Women. Michaels has published three collections of poems, Ghost Notes, Reviewing the Skull, and The Forest of Wild Hands, and has authored two books for NCTE in addition to Catching Tigers in Red Weather: Risking Intensity and Dancing With Words. Read a sample chapter from Catching Tigers in Red Weather or order a copy from the NCTE Store.